IBM Spectrum Virtualize and SAN Volume Controller is a storage virtualization system that enables a single point of control for storage resources. It helps improve business application availability and greater resource use. The objective is to manage storage resources in your IT infrastructure and to ensure that they are used to the advantage of your business. These processes take place quickly, efficiently, and in real time, while avoiding increases in administrative costs. IBM Spectrum Virtualize and SAN Volume Controller supports attachment to servers through Fibre Channel (FC) protocols and Internet Small Computer System Interface (iSCSI) protocols over IP networks at 1 Gbps and 10 Gbps speeds. 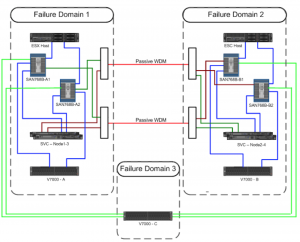 These configurations can help reduce costs and simplify server configuration. Spectrum Virtualize also supports Fibre Channel over Ethernet (FCoE) protocol. IBM Spectrum Virtualize and SAN Volume Controller combines hardware and software in an integrated, modular solution that is highly scalable. An I/O group is formed by combining a redundant pair of storage engines that are based on IBM System x server technology. Highly available I/O groups are the basic configuration element of a Spectrum Virtualize cluster. The configuration flexibility means that your implementation can start small and grow with your business to manage very large storage environments. The scalable architecture and tight integration enable your business to take advantage of the high throughput of solid-state drives (SSDs). This configuration supports high performance for critical applications. 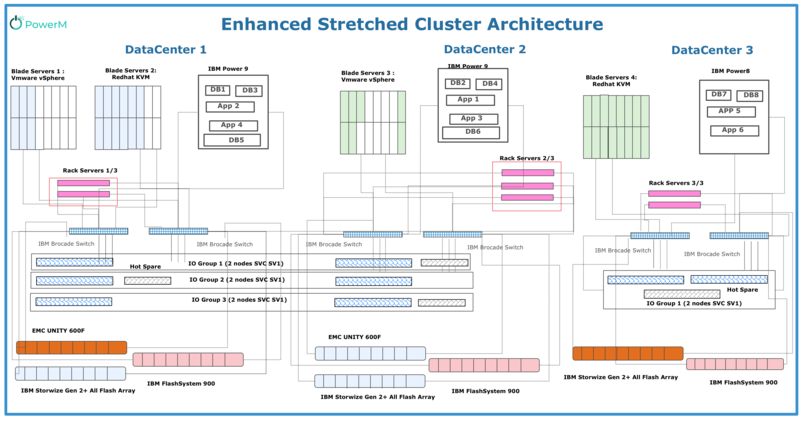 In addition to the automatic failover that occurs when a site fails in a standard stretched cluster configuration, an enhanced stretched cluster provides an additional manual override that can be used to choose which of two sites continues operation. Combining stretched cluster configurations with the Volume Mirroring capability provides a continuous availability platform whereby host access is maintained during the loss of any single location. With the stretched cluster configurations, the two nodes in an I/O group are separated by the distance between two locations. If a copy of the volume is stored at each location, you can lose either the SAN or power at one location, and access to the disks remains available at the alternate location. Using this behavior requires clustering software at the application and server layer to fail over to a server at the alternate location and resume access to the disks.